Two reviewers take on one book and deliver their thoughts on the latest novel by the acclaimed author Sam Savage. I’ve been thinking about fractals a lot. It started while leaning over in a friend’s garden, munching on the tops of brussels sprouts with dirt on my knees and pondering their infinite broccoli and asparagus-flavored folds. If brussels sprouts, sea shells, wood rings, triangles—what have you, are constantly repeating themselves, does the human mind and writer do the same thing? Answer: Only if they’ve been driven batty. 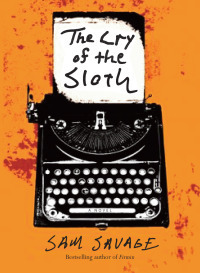 Sam Savage’s The Cry of the Sloth impressively portrays the battiest side of writing, editing, loving, perving, and being through the tightly wound mind of Andrew Whittaker.